Perhaps it is because of my work with adoptees and DNA that I so appreciated her story, but more likely it was just that she was terrific and the tale was so well told. I also got to see the short form of her documentary at the media dinner, definitely worth seeing. My other favorite keynote speaker was David Isay and his StoryCorps. His concept is to get two people in a booth, facilitate their conversation, and record the result for posterity. I think the story I liked best was the one where the boy with Asperger’s interviews his mother – Sarah and Joshua. But every snippet he played for us brought tears to my eyes, the wild grandad, my son the veteran, and the boy who became close to the mother of the boy from the rival gang that he had killed. And of course it was great to see A.J.Jacobs again and hear a report on the Global Family Reunion. Since DNA is my passion I went to most of those talks, mainly to get ideas on how to better present DNA talks myself. I actually learned a few things. Rising star Paul Woodbury of Legacy Tree Genealogists gave me some good ideas about a testing plan, Tim Janzen showed how to use quantitative analysis of cMs to prove genealogical lines, and the panel discussion moderated by Extreme Genes’ podcaster Scott Fisher on the future of DNA was great. I only wish it had gone on longer. Then there was the inspirational talk about DNA.land – a non-profit lab which was one of the leads on the recent break through in schizophrenia genetics. They want your DNA for research; check out my blog post about them, another one coming soon. My New Year’s resolution this year was to research further on the Bavarian Catholic side of my family so I went to both German genealogy talks and enjoyed them greatly. Now to put those lessons to use. I ran into the great German genealogist Warren Bittner at the Family History Library and found out that the Passau parish, where my ancestors are from, is the only Catholic parish to have put their records online, lucky me! Addendum: I also chatted with Finn Karlsen at the Family History Library and he told me that the online Norwegian archives now take an wildcard in the middle of a name. See my post on his talk from two years ago at Rootstech for more about those archives. Disclaimer: My brother is Shipley Munson, the familysearch guy who puts Rootstech together. 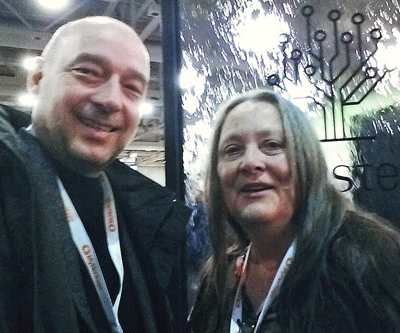 ← Will I see you at Rootstech next week? Kitty it was wonderful to be in your class! I bought you a glass of wine and I hope you enjoy it! Working on mapping my mothers, sister, and my DNA to get a better understanding. Thank you for a wonderful experience! Bonnie, thank you so much! I am delighted that my class was a help to you.